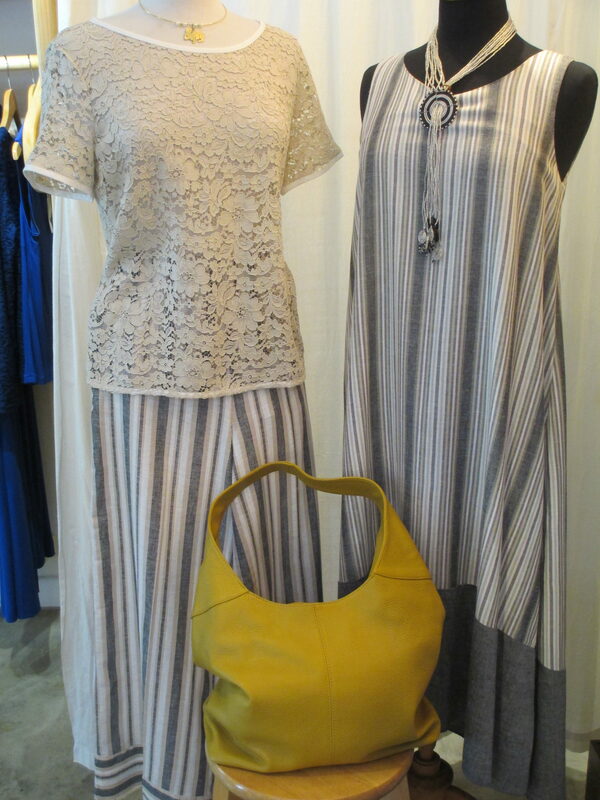 From left to right: A Viscose & Cotton blend Short Sleeve Shirt made in Italy; a Linen & Cotton Blend Grey, Beige & White Striped Long Pants with a Nature inspired Bronze Necklace with a Rabbit Pendant handcrafted in Italy. One-handle, zipped closure soft genuine leather handmade medium size mustard colour bag from Florence Italy. Zipped divider compartment, phone holder and small zipped pocket to keep your belongings tidy inside. A Grey, Beige & White Striped Linen Dress with a White & Black SERUNTIA Necklace made of recycle glass, design in Milan Italy and Handmade by Maasai Women in Tanzania. ← Bring Some Colours To Your Wardrobe with Matilde’s Selection Of The Week!